They didn't come here to make peace. They came here to make trouble. You cannot trust them. They are heathens. Hvitserk: Ubbe treated me like his little faithful dog. 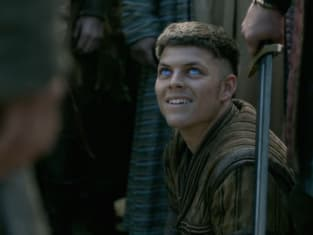 I am no one's dog, Ivar. The Bible also tells us to show no mercy to unbelievers. Against these devils and pagans, we are the wrath of God. Lagertha: Will I ever see my son again? Seer: Yes, you will see him again, but in terrible circumstances. Lagertha: What do you mean? Seer: The consequences of Ragnar's death have not yet played out. You have only seen the beginning of the end. So now prepare yourself for what is to come. If you take my advice, let their condition worsen further still. Let them suffer more dismay, until only creatures of rags and bones wander the streets of York. Then we attack.